I was not as hot as I thought as a cool breeze blew through the tent a good portion of the evening and when I woke I needed the provided blanket to wrap around my arms. The sunrise was spectacular peeking through with vivid shades of deep purple, fuchsia and golden orange temporarily distracting me from the urine odor. We can say that we now have officially “glamped,” though I think the experience was a little overrated or perhaps I prefer to keep them separated. If I wanted a nice hotel, I’d stay there. If I want to camp, I want all the efforts and smells that entails. As expected, Kenzi had a hard time going to sleep with the heat but finally settled in as the temperatures dropped sometime during the night. 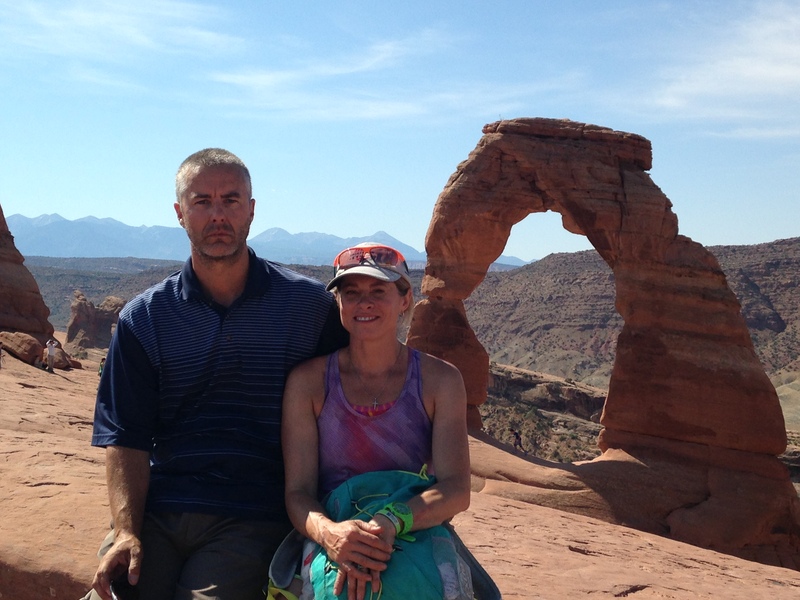 After coffee and toast over the camp stove, the older two and I went for a ten mile ride towards Moab where we met Scott and Viv outside of Arches National Park. I was glad we were biking toward town and not out, as part of the ride had a nice 7% grade in our favor. 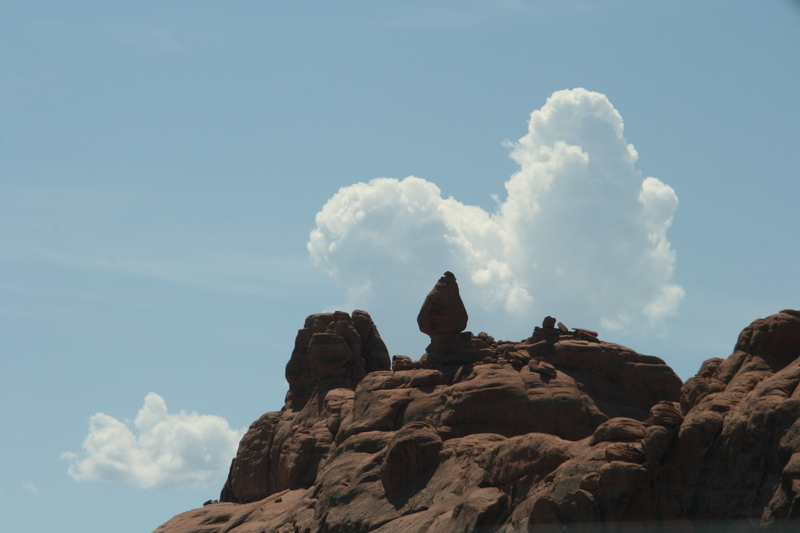 Per a recommendation, we hiked to Delicate Arch, which was a little more strenuous that I had prepared for. Collectively the group thought Angels was tougher, but this particular hike was mostly in the sun. Even the 70spf we have been repeatedly applying, seemed like no match to the hot rays as I could feel the sun penetrate my arms. IT has been interesting to watch people and their choice of clothing during many of the hikes. 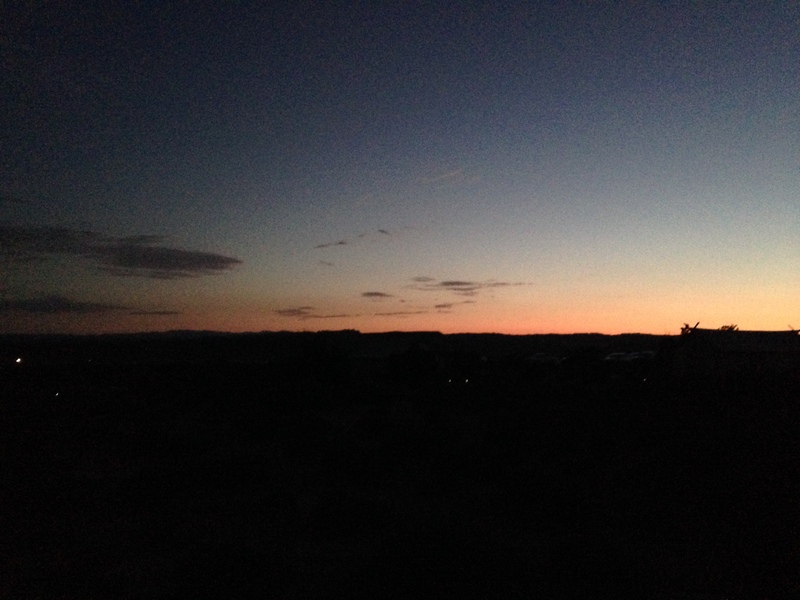 I was glad we chose to do it earlier in the day, but had I known, I would have suggested a sunrise a hike. With the steep and less than forgiving rock face, I might have skipped the morning ride with the kids as they show no mercy and I always give my best attempt at not embarrassing myself too badly. So needless to say, I was not operating on a full tank. At some point during the trip, the kids and I had apparently developed hooves and climbed effortlessly up and down the hills and off trail like mountain goats. Kenzi has mentioned several times an interest in picking up rock climbing though I am not sure when we would fit that activity in. However, I completely understand the motivation behind her desire. There was definitely something to be said about being one with a rock and using your own body weight and strength to pull up and around to the next flat surface (off trail version). 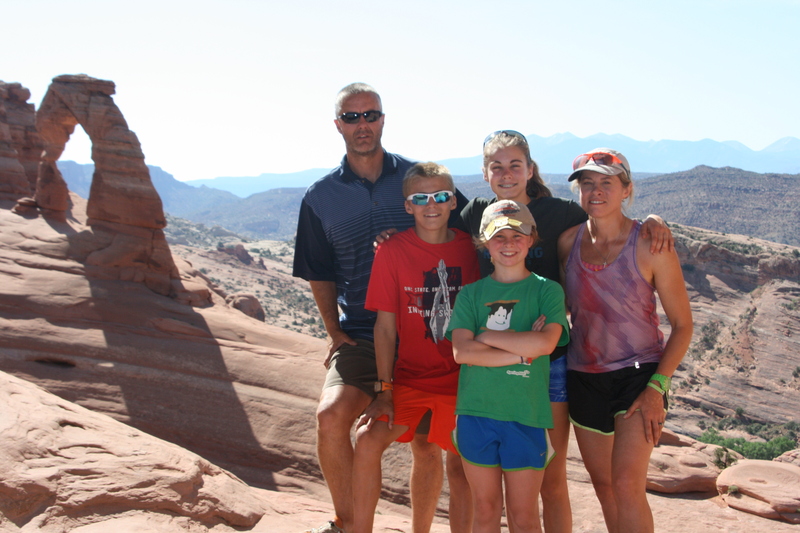 We all have lived in our Keens for a good portion of the trip and though not rock climbing shoes, they have been able to provide enough tread to support my climbing activities and they have worked very well for traversing rock cliffs and steep inclines. 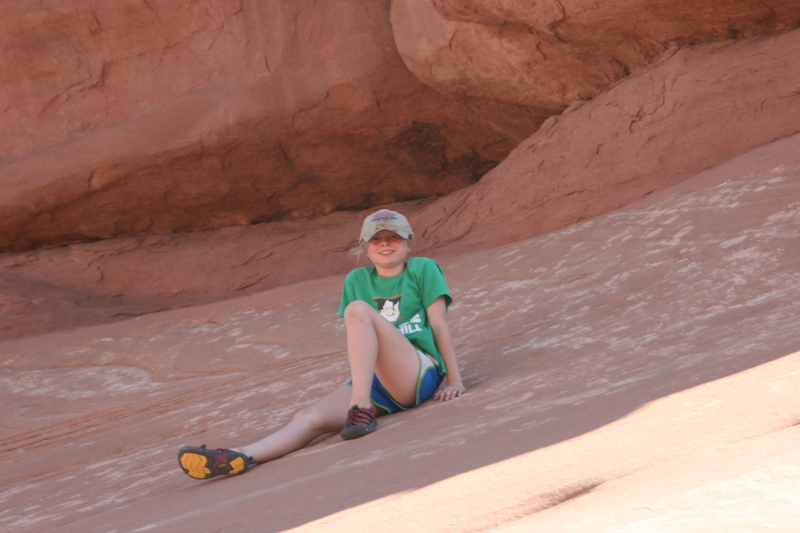 I am not saying I will not be sore tomorrow as Delicate Arch was a strenuous trail, but I have been able to stay up with the two older kids and even carried Viv down the mountain on my back without slipping and sliding. Scott did his share with Viv patrol as we descended the unsteady incline as she had at some point developed a blister that was causing her a bit of grief. Once done, I immediately downed an icy cold beer from the night before. Without complaint, I had given my water resources to the kids and though the gum alleviated my parched mouth, I was thirsty…..really thirsty. The sign posted at the beginning of the trail stated that it was strongly advised that each person carry at least 1L of water and though I was taking small sips from my surrendered bottle, it was almost not enough. From the beginning of this trip through now, I cannot stress the importance of the signs and the location of the postings. I think in the Midwest we take for granted the signs like “Deer Crossing” because maybe you will, maybe you won’t see one and we become cavalier about them. 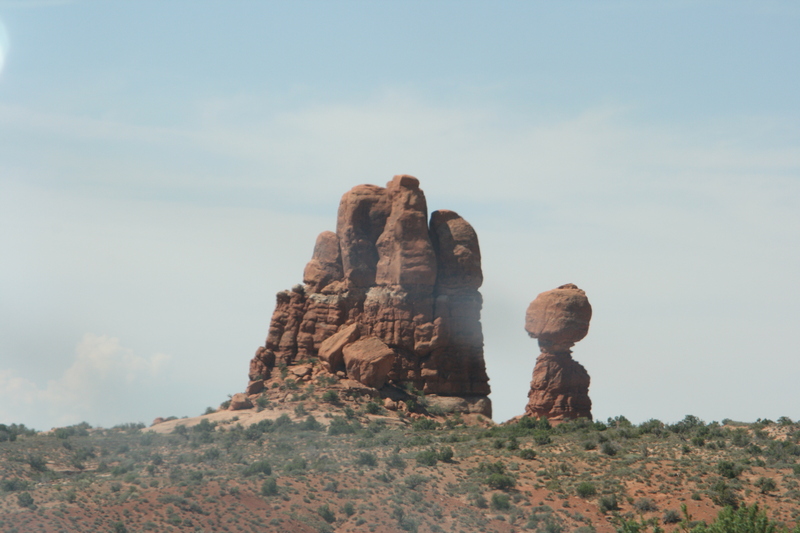 But out west, they have life-saving significance because you see “Falling Rock” there was falling rock. “Bear” means you’ll see bear. The “Turn off your car to avoid over heating” sign in Death Valley meant, we obeyed as we did not want to experience a car stuck in 134 temps as had heard travelers talking about over heated engines. Needing a little break, we headed to the Visitor’s Center to learn a little more about the statuesque formations and enjoy some much needed AC. I think it was in the high 80s and I was tired. 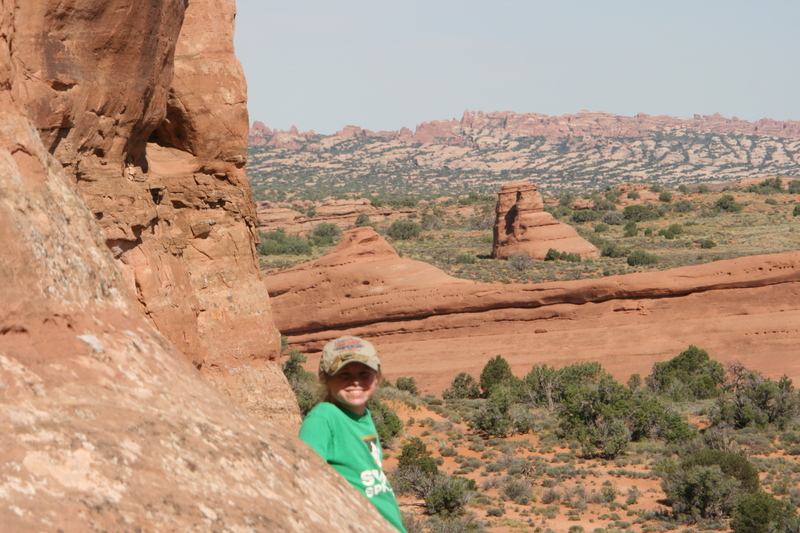 Viv filled out her paperwork to become junior ranger, the fourth of the trip, after we sat through a short presentation on Arches. Though a bit repetitive, it was fascinating to learn a little about the formation of the unique sculptures due to time, weather and gravity. When we get back home, I will contact NPS and secure the booklets from the parks that we did not do early on in our trip. They are crammed full of interesting information unique to the parks for both old and young alike and Viv gets a kick out of the whole “swearing in” process and receiving her plastic badge which she proudly displays on her hat. Still wanting to get a swim in, we headed into town to the rec pool where the kids had the choice of swimming indoors at 84 degree water or outside with 82. Not sure why they keep their pools so warm out west, but the kids still are not digging the bathwater temperatures. Unfortunately, lap swimming ended about an hour after we arrived, so the kids could not get their full work out in, but it did allow them the opportunity to just be kids and go off the high dive and corkscrew waterslide. Not exactly what they wanted to do, but I think I noticed a slight smile after a couple of jumps and twirls. Sometimes it’s good just to be a kid! As they swam, Scott and I once again repacked the car for our final leg of the journey as there will be no more camping, and hopefully no more laundry, but the second will depend on the stink. We ate a late lunch (barely) as most places in downtown Moab were closing around three but managed to devour sandwiches and fresh cherries within record time. 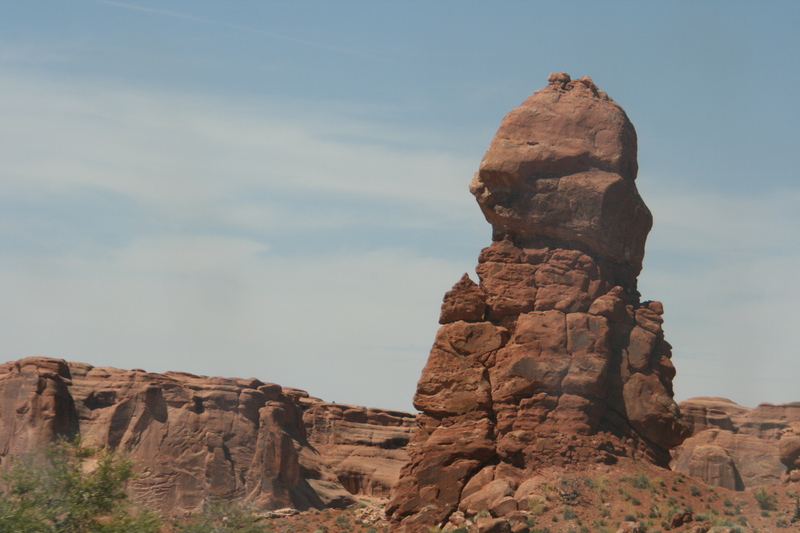 We were then off to Colorado Springs via 128 out of Moab. 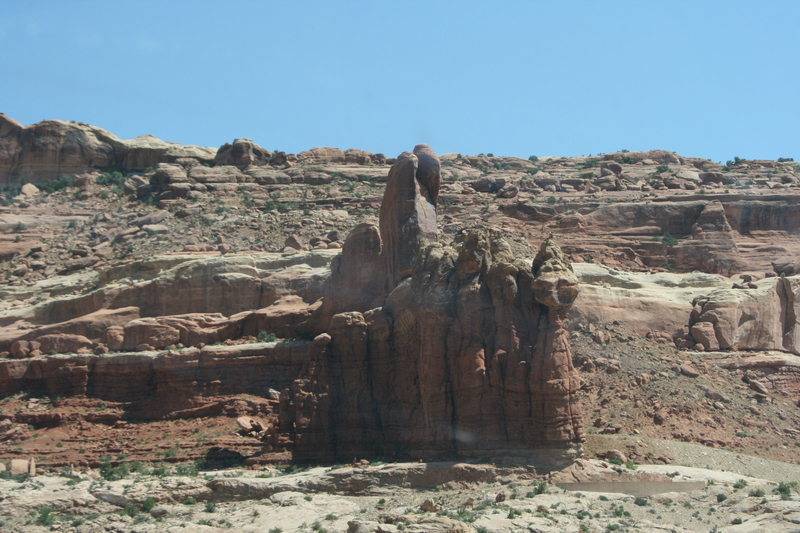 Between the heat and the noisy racket of vinyl, there was really no winning choice, I choose to endure the heat to compliment the bright red rocks as we drove alongside the Colorado River out of town. The drive across 70 just west of Fruita, CO was once again a welcomed surprise as we traveled alongside the Colorado River where it slowly changed from a reddish brown to a murky greenish blue to eventually white rapids and clear rumbling streams of fish laden waters. 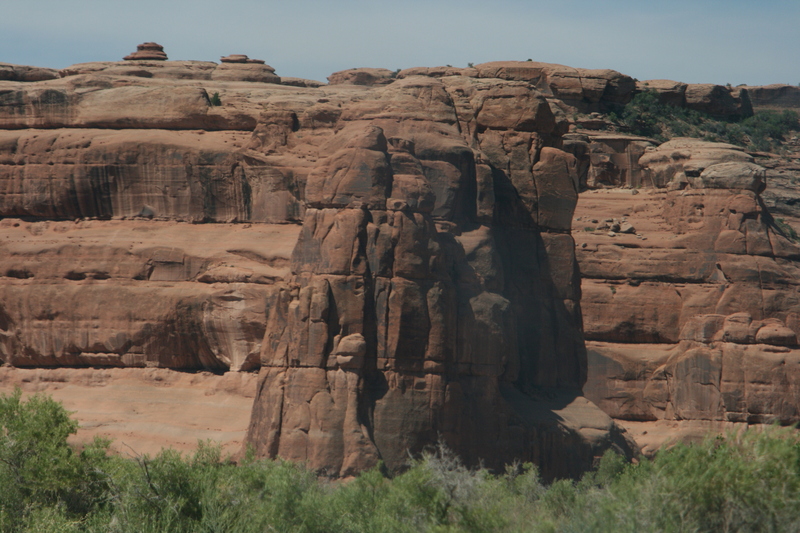 It was a nice break from the dry arid desert land that changed appearance with the landscape at ever bend. When we got to Gypsum, the mighty Colorado River wound North, and we picked up a charming tributary called Eagle River, which continued to keep us company along I-70 until Edwardsville. Dotted with rapids, pines and the occasional fisherman casting along the shadows of the early evening light, I was briefly transported to world far away. We have seen some beautiful places throughout this journey, but Colorado might just have the best of all things me. With a great love of the outdoors and trout fishing, my only regret in life was that I never made it to this place to fish with my grandfather who instilled a great passion and love for all things outdoors including trout fishing, but knew he was with me in spirit. In fact, both of my grandparents have been with me this entire journey. So many life lessons learned through them, and for a moment found reminiscing those who were dearly loved and deeply missed. No sooner than the river ended, Scott and the kids noticed a bike trail along the road and followed it along the highway for over seventy-five miles. There have been so many incredible bike trails both used and seen and it has been one of my favorite memories thus far on the trip. As we rounded yet another bend, we were at 11,162 elevation, the highest of our journey thus far. We then saw the first signs for a huge 1.8 mile tunnel ahead complete with heavier traffic. With great anticipation, we entered the east bound Johnson tunnel while the Eisenhower transported cars westward in equal distance. Nothing beats a nice long dark tunnel and if you ask kids, we have seen quite a few this trip. I think we have passed through about eight to ten tunnels throughout the trip, Zion being the favorite. We have seen six rainbows, including a double outside of Denver; twelve cargo trains, sixty deep at least and more wildlife than anyone expected. There have been so many different, not necessarily unique, but perfectly timed experiences for us on our journey and we feel incredibly blessed. But as the day closed after a long afternoon of driving, my threshold and tolerance level started to wane. I tried to find my happy place, as I had had my fill of all ranges of bodily functions, slapping sounds of vinyl, banana slug jokes, battles between which movie was better, Ratatouille or Frozen, the endless laughing of Kenzi through it all, the lack of WIFI for Drivers Ed class, “It’s so hot” complaints, and on and on . When we arrived at Chipolte, the dinner place of choice, everyone but Viv was happy. It was enough to send me over the edge and I did not respond well. Unfortunately, Viv took the brunt of my frustration as I let the entire car and parking lot know that I was done! Actually, five hours ago I was done but tried to desperately to enjoy the beauty as it would be fleeting. Everyone has been extraordinarily good on this trip and not once have we heard “Are we there yet?” but we all were getting slap happy, tired, and increasingly loud to drown out the noise from the broken window and I lost it and for that I was very, very sorry. When we arrived at the hotel, after an hour of silence, the kids went immediately to bed as the pool was already closed for the evening and no one wanted to complain about another thing. I definitely took care of that in my tirade. After Scott and I coordinate placement of the car in the parking lot with the front desk, we made to our room which was across the hotel only to find the kids all sleeping in the same queen bed. Apparently, my episode was enough to afford me my own bed with Scott and though I felt guilty how it came to be, I was thankful to get a good night’s sleep without someone rolling, kicking and sleeping on top of me.